real participation of state regulators! WHY DO YOU NEED TO TAKE PART? WORLD AROUND US: New customer requests. What and how they buy? 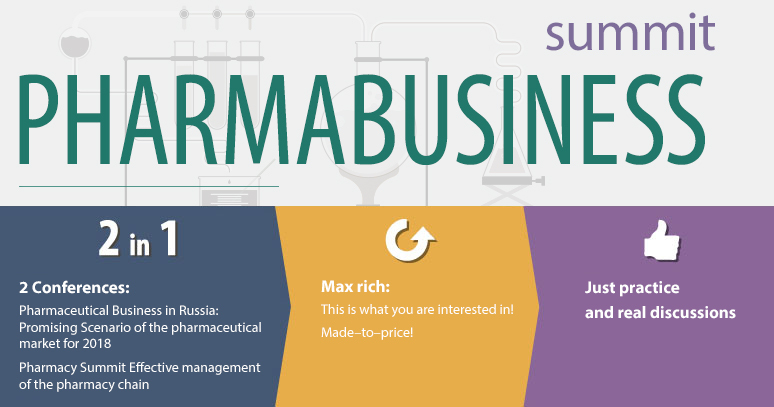 DISCUSSION: Building factories for active pharmaceutical ingredient production: How to buy them? ABOUT PEOPLE: How to stuff the drug shops? Chief representatives of pharmaceutical manufacturers, general and commerce directors of Russian pharm companies, distributors of companies and pharmacy chains. We are looking forward to see you at the key event of 2017 for all pharmacy retail!